1000Bulbs.com has recently acquired a stylish collection of antique lighting fixtures from US-based manufacturer Sunlite Lighting. Antique lighting fixtures now available at 1000Bulbs.com. Antique light bulbs have become popular in homes, restaurants, and even luxury hotels,” says 1000Bulbs.com CEO Kim Pedersen. “What better way to showcase these beautiful bulbs than in fixtures with an equally elegant look? Online lighting retailer 1000Bulbs.com has recently acquired a stylish collection of antique light fixtures from US-based manufacturer Sunlite Lighting. Ideally paired with matching antique light bulbs, these rustic fixtures are made to give any room an industrial yet modern appeal. With the addition of turn-of-the-century inspired pendant lights to nostalgic wall sconces, customers can now find everything they need to update their home or commercial space with vintage lighting at 1000Bulbs.com. Sunlite Lighting was founded in 1980 by Morty Kohn as a one man operation and has since evolved into a multinational enterprise. The company works tirelessly to introduce new and innovative products to the marketplace while constantly improving their existing line of items to meet the high expectations of their current customers. 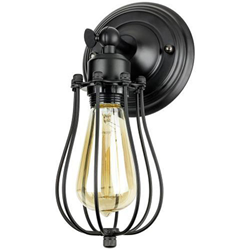 Although 1000Bulbs.com has always supplied the parts necessary for customers to create their own antique fixtures using sockets, cords, plugs and cages, these new Sunlite fixtures offer even more options for displaying 1000Bulbs’ substantial selection of historical bulbs.